musings of the big red hen: Are you really hungry? I have been on a diet for almost a year....and so far I have lost 23kg :) I started the Dukan Diet on the 1st of September 2010, and it has been easier to follow than any diet I have previously tried (although there haven't been that many), but still hard to stick to all the time. Things went very well last year and I lost 16kg by Christmas. But then, well, as I said, it was Christmas. I didn't gain anything over this joyous period of over-indulgence and feasting, but I did loose my momentum. Luckily my best friend was getting married in March 2011, and I was the Maid of Honour, so that gave me the push I needed to get going again, but I only lost another 4kg by the wedding - good, but not great. Since then I have only lost another 3kg, and I want to loose 5 more, by the 1 year mark. Argh....are you bored of this story yet? Ok, I'll come to the point. 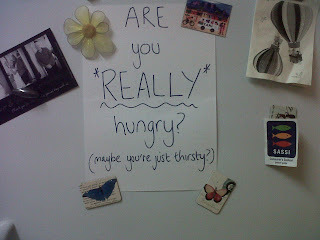 So, I have decided to post this sign on my fridge in an effort to stop myself from mindless eating.